If you follow this blog, you haven’t had much to follow lately. I’m still grappling with site-hacking problems. Their persistence leaves me frustrated and far, far from gruntled. Two busy, productive couple of days working with a great client have re-energized me, so I’m back in business. And, as a bonus, we’re halfway through the Ten Steps. Step 5 in Ten Steps to Complex Learning is “analyze cognitive structures.” As the diagram depicts, this step falls under the “supportive information” component of the overall learning blueprint. Van Merriënboer and Kirschner point out that when someone encounters a task that’s different from what he’s seen before, procedural knowledge isn’t enough. He needs strategic knowledge–a way to figure out how to do what he haven’t done. Using SAPs in design decisions. A strategic approach to problem-solving has a goal, and likely subgoals as well, related to solving problems in a particular domain. The SAP also has heuristics to help reach that goal. In fact, those are key to SAPs. …SAPs are always heuristic….though they may help a learner to solve problems in the task domain, their application does not guarantee the solution of the problem. Although they are less powerful than algorithmic procedures, power is exchanged for flexibility, because SAPs may be helpful in many more different problem situations than a solution algorithm. Start the development of a key part of the supportive information discussed under Step 4. If you’ve read any of the other posts in this series, you know how vM&K will go about identifying these strategies. They’ll interview and observe expert performers performing the actual tasks, starting with relatively simpler ones and progressing to more difficult ones. Sometimes the problem-solving process is mostly linear or sequential. The much-maligned ADDIE model for instructional design (analyze, design, develop, implement, evaluate) fits that category. If you were working with expert designers, you could identify simpler and more complex goals in each of those stages, and from that develop simpler and more complex SAPs. vM&K use “solving thermodynamics problems” as an example of a non-linear set of phases to use in a particular domain. Another example might be the CRAP principles for designing text and graphics (contrast, repetition, alignment, and proximity) that Robin Williams explains in The Non-Designer’s Design Book. The general form of a heuristic is, “If you want X, then do Y.” Rules of thumb are midway between domain-specific algorithms (like, say, how to calculate the number of shingles needed for a roof) and full-blown problem-solving methods in a domain. The image at the right (which you can click to enlarge) is an example of rules of thumb for managing conversations on a blog. Provide learners only with rules of thumb they don’t yet know. Limit the rules to those necessary for performing the most important tasks. Find a balance so the text is as specific as possible but applies to all the situations where the rules make sense. You see that the first step is to analyze the cognitive strategies used by experts, since these are built up and refined over time as the experts grapple with a range of problems in the domain. What you end up with is how the task should be performed. If you observe the target learners addressing the same tasks, you find out how they are performed. These are the approaches that non-experts figure out on their own–that they intuit, hence the lable “intuitive strategies.” Often, though, these naive approaches don’t work all that well. For examples, novices often take what the authors call a top-down, depth-first approach. In programming, that might mean breaking an overall problem into a group of subproblems, and then attacking each subproblem in depth: writing highly detailed code for one section at a time. As a result, the novices can lose track of relationships between sections, and they’ll often spent a lot of time linking things together after the fact. Experts in contrast take a top-down, breadth first approach. After identifying the subproblems, they’ll continue to expand each subproblem before starting extensive coding. An instructional design example might be breaking a large course up into what seems like logical sections. Less-experienced designers tunnel down into the separate sections, writing them in detail. More experience designers (ahem) will break those subsections down but will tend to think of them in outline or summary mode, making it easier to move up and down levels and see the larger picture. In a client project I’ve been working on, this means we haven’t yet finalized the overall sequence for what will be a two-and-a-half-day workshop, but we have what I think of as lots of recipes for areas of concentration and for activities. We sketch enough detail so understand them and look at the design for other course elements. It’s much easier to refine and shift at this stage. So we won’t end up with, say, a freestanding section on ethics (which most of the time is like a long sermon on a warm Sunday). Instead, we plan an activity where participants handle a typical contract problem, then they’ll get questioned by the client about business-ethics issues, embedded (as in real life) in what looks like real work. Think of a beginning driver: her naive model for steering is “keep the car straight at all times,” resulting in constant adjustments of the wheel. The skilled driver’s heuristic might be something like “aim 20 feet ahead of the car,” providing more reaction time and seeming to ignore the distance directly in front. But the latter is the more effective strategy. So what? If you find that novice learners come to complex learning with naive strategies in place, these will conflict with more carefully worked-out strategies. If you’ve developed strategic approaches to problem solving, you’ve got a head start on a number of design decisions. You can design problem-solving guidance, like process worksheets or performance constraints. You can present rules of thumb as statements (“if you want X, do Y”) or as guiding questions (“what might lead you to develop a job aid for this task?”). You can develop or refine task classes based on a sequence of SAPs. You may need to provide extra guidance, especially to prevent the unproductive or even mistaken results that would come from the naive strategies. Performance constraints can come into play. The authors have an example in which researchers have to frame an effective database query before they can enter it into the database–to provide practice in preparing effective queries. Similarly, the use of task classes (groups of problems at a similar level of difficulty) provide extra opportunity for the novice learner to work with the new strategies–although, as vM&K point out, some intuitive strategies are highly resistant to change. Modeling examples can help (seeing a skilled performer in action and hearing her comment specifically on her strategies). In addition, less use of inductive approaches and more guided discovery will allow learners to interconnect parts of the new skills, and to integrate the new strategies into their repertory. You can give an SAP directly to a learner (it’s supportive information, remember, which means it’s helpful for the non-recurrent tasks). SAPs can help you find or design modeling examples. SAPs can support cognitive feedback–for example, have learners compare their own process with a given SAP. This was the shortest Ten Steps chapter to date, so the next post in the series will move on to Step 6, Analyze Mental Models. CC-licenses project-status photo by brylyn. CC-licensed rules for blog conversations by choconancy1. CC-licensed audio-mixer photo by magnifynet. I have always believed that education is knowing what to do when you don’t know what to do, which is where, I presume, you got “when you don’t know what to do”. The fact that it takes a deal of education to be able to do all this, more or less speaks for itself. But lately, with education being put under the (electron) microscope, I’ve been reviewing the adage. I still think it’s right. Ken, I like the observation a lot. It brings to mind the idea that training traditionally mainly focuses on procedural things (what our Dutch professors call recurrent tasks). 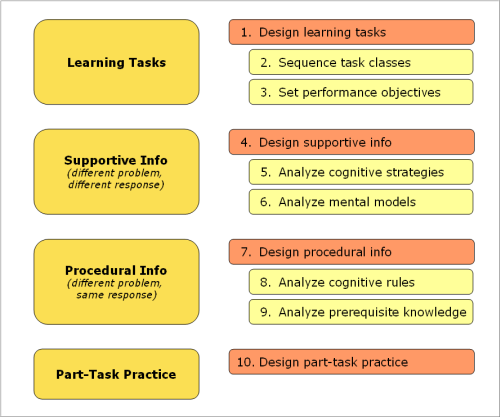 The subtitle of the Ten Steps is “a systematic approach to four-component instructional design.” Steps 4, 5, and 6 all deal with supportive information, which by definition means things that support the non-recurrent tasks–those for which your approach not only does differ, but has to differ.